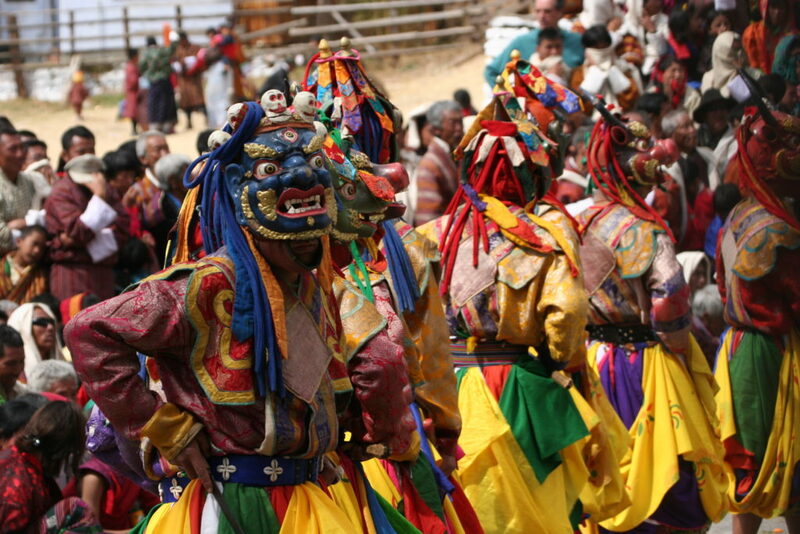 The highlight of the tour is the Paro Masked Dance festival, which lasts five days (from 27th to 31st March in 2018) and is an occasion for the locals to attend and get a special religious blessing. Every day there are various religious dances performed by Masked Dancers. If you attend the festival on the last day at dawn you can witness the unfurling of the huge thangkha from the top of the monastery building. The thangkha remains unfurled only for a few hours in the early morning so that people can get a blessing and various prayers are performed during this time. In this compact cultural tour you will also enjoy the beautiful landscapes and varying climates of Thimphu, Paro and Punakha. In addition, explore the main towns and countryside of the high-altitude Bumthang plateau, full of Buddhist sites of pilgrimage and history. Arrive in Paro and drive to Thimphu (1 hr). Free time before lunch. Spend the afternoon sightseeing in Thimphu. Visit the Chang-gangkha Temple, where locals take their children to be named. Drive up to the Takin Reserve to see the national animal and visit one of a choice of museums. Archery is the national sport of the Bhutanese so spend some time at the archery ground today where you are sure to find some archers honing their skills. Finally, take a stroll to the Memorial Chorten, where you will meet people of all walks of life circumambulating the stupa with their hand-held prayer wheels. Day 2 SIGHTSEEING IN THIMPHU: CRAFTSMEN AND DZONGS. Start the day at the huge Buddha statue with a great view over the city. 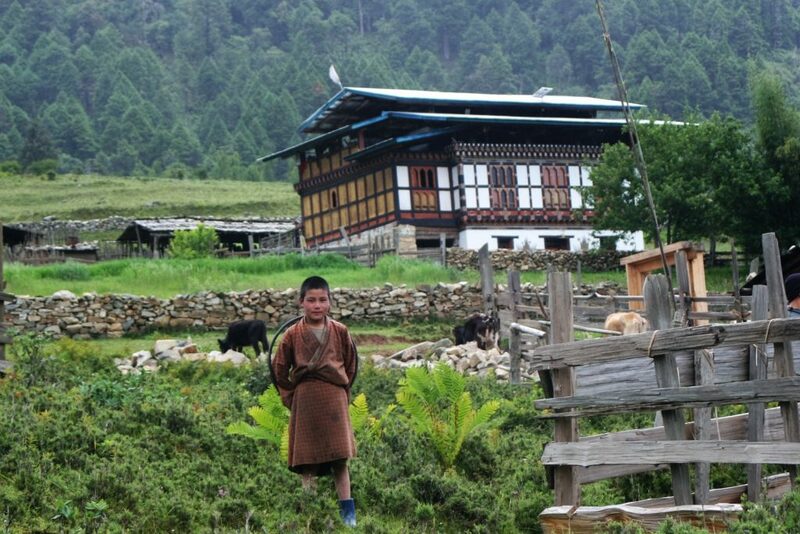 Visit the Folk Heritage Museum to get an idea of life in an ancient Bhutanese farmhouse. At the Institute for the 13 Traditional Arts (Zorig Chusum) students learn one of 13 skills such as statue-making, Buddhist painting or silk embroidery. If you are interested in traditional herbal-based medicine you can choose to visit the Institute of Traditional Medicine. Alternatively, at the Textile Museum you will learn about the intricate silk weaving which is very much a part of Bhutanese culture. Finally, visit the impressive Thimphu Dzong (Trashichodzong) which is a fortress-like building housing important offices of both the government and the monastic body as well as a number of temples. Dinner in one of our favourite restaurants in the city. Day 3 DRIVE TO PUNAKHA: TEMPLES AND DIVINE MADMEN IN PUNAKHA. Drive to Punakha (2½hrs). 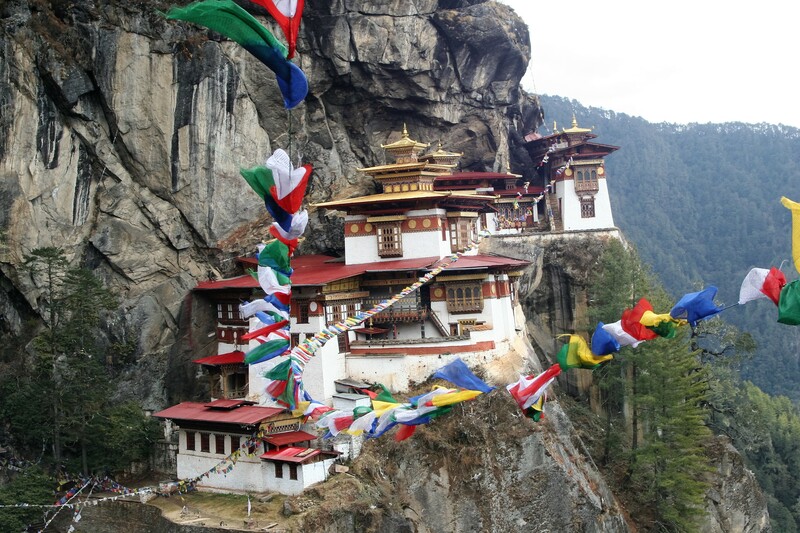 A one-hour drive from Thimphu brings you to the Dochula Pass at an altitude of 3,000m. Stop to circumabulate the 108 chorten and enjoy the view of the Himalayan peaks in the distance. Descend to 1,200m to Punakha and visit Chimi Lhakhang, the temple of 15th Century Lam Drukpa Kuenley, also known as the “Divine Madman”. A short walk brings you back to the village where you will be met by your vehicle. Lunch in a nearby restaurant.In the afternoon, continue towards the impressive Punakha Dzong, which was the former fortress capital of Bhutan. The monks live here during the winter months, moving from their cooler summer residence in Thimphu Dzong. In the morning, relax in Punakha. This valley is warm and dry so it is a nice place for some pleasant walking and visiting villages, getting a feel for the daily life of the people. Start early with a hike to Khamsum Yuelley Namgyal Chorten. As well as visiting the stupa you will get a lovely view of the Punakha river valley from here. Before lunch, drive to the lovely, high-altitude Phobjikha valley (3½ – 4hrs). Stop for lunch en route. 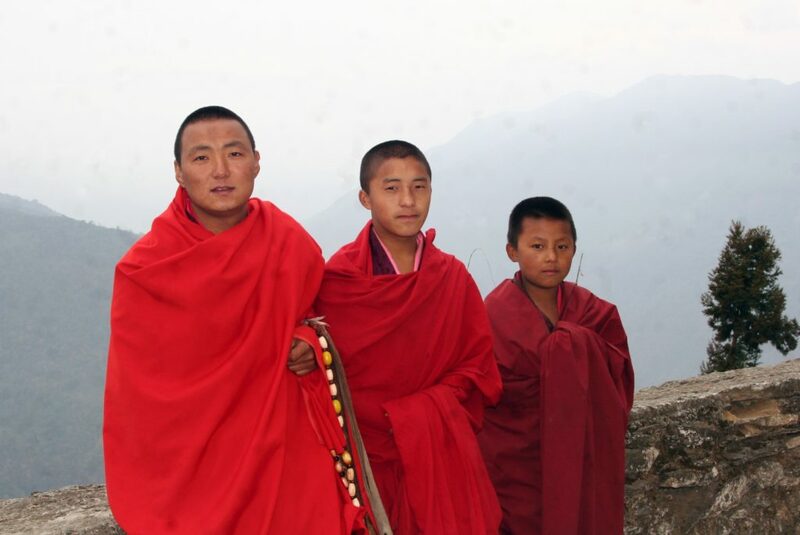 Visit Gangtey Monastery and the school for novice monks known as a ‘shedra’. Spend a relaxing morning in Phobjikha, visiting the village and stopping for butter tea (known as Suja) in a farmouse. This is an ideal place for some easy hiking. The rare black-necked crane are only in the valley from November to March, making it their winter home, but you can visit the black-necked crane information centre to learn more about them. Set out for a hike that can be of anything between two hours and 4 hours depending on your preferences. You can hike through the forest, on the Nature Trail, passing through some small villages and farmland. 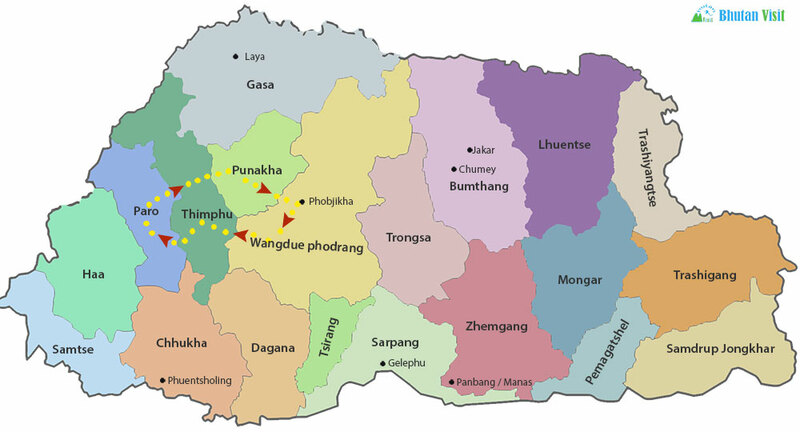 The return drive to Punakha takes about 3 – 4 hours. Start early on the drive to Paro and, after an early lunch attend the festival in the afternoon. The festivities consist mainly of masked dances that convey a moral lesson, chanting, blessing & reading religious texts. The repertory of masked dances and the gorgeous silk costumes are the same for all the ‘tsechu’. The Paro Tsechu takes place both inside and outside the Rinpung Dzong, depending on the day. Thronging with more locals than tourists, these occasions are a visual delight. Everybody dresses up in their most gorgeous woven silk kira and gho and adorns their most precious jewellery, chunky necklaces of turquoise, coral and “cats’ eyes”. Rise at dawn and attend the festival in the Dzong where the monks will unfurl a huge silk thangkha from the top of a tall building. 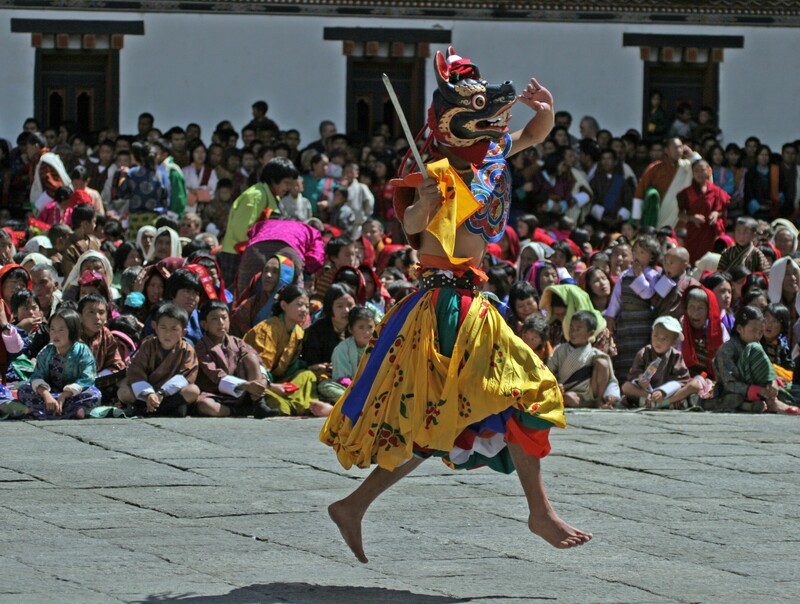 Witness the prayer ceremonies of the monks and lamas in their colourful robes and the devotion of the public. Return to your hotel for breakfast. If you decide to miss the 4am start, you can still attend the festival around 7am and spend the morning watching the ceremonies and some dances. The dances continue into the afternoon.In the afternoon, drive towards the ruined fortress Drugyel Dzong from where you can get a view of the distant Jhomolhari mountain and enjoy the rural scenery of the valley with its small villages and farms scattered here and there. 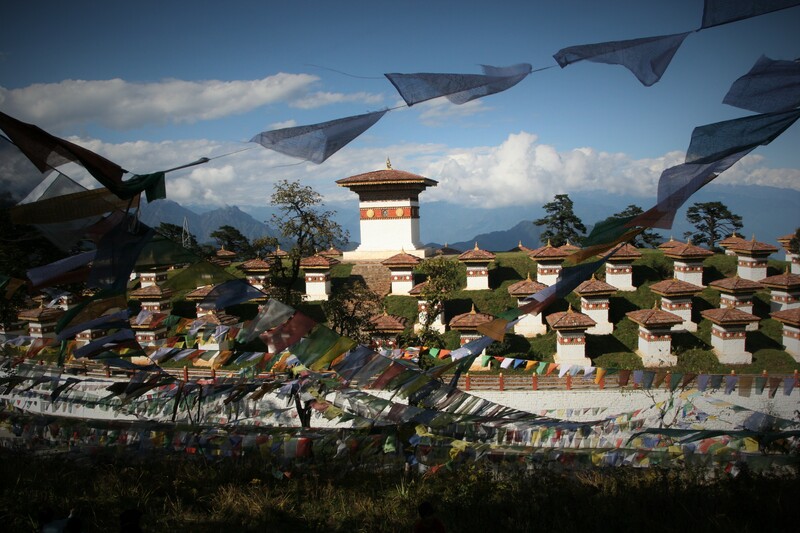 On the return to town, visit Kyichu Lakhang, one of the oldest temples in Bhutan. Day 8 MORNING HIKE TO THE TIGER’S NEST: A TRUE PILGRIMAGE.Hike or horse ride to Taktsang temple, also known as the Tiger’s Nest, which is built into the sheer rock face at an altitude of 3,000 metres. This is a highlight of the tour and involves a 2- 3 hour uphill hike. The visit to the temple, and the return hike downhill to the base makes takes between 5 to 6 hours in all. This hike requires a certain level of fitness but is not excessively difficult. Return to your hotel for lunch. Afternoon at leisure. You may wish to book a massage or treatment at the hotel spa to relax after your hike. Or you can take a short rest and visit Paro town in the early evening before dinner. Your guide and vehicle will be available and will plan the afternoon according to your preferences. Day 9 Flight departure from Paro. Tashi Delek! On each day we give an indication of the driving time (in brackets). This refers only to the time spent driving and not to the sightseeing and stops, which will be in addition to this. The road conditions are changing constantly due to ongoing road widening works but your guide will update you with the latest information at the time of your tour.